Fasnacht, or Carnival as it is known in many parts of the world, is the Christian celebration that comes right before the lean forty days of Lent that precede Easter. It's full of bright costumes, parties, greasy food, and boozing. In Switzerland, it is celebrated in the typical way—big street parties, loud music, parades, dressing-up, many traditional fried delicacies, and plenty of drinking. The music is provided by Guggenmusik bands. These are brightly dressed groups in matching costumes, complete with painted faces or elaborate masks. They play popular music with typical marching band instruments, (and there are just as many renditions of Wild Thing). Video here. Although my threshold for listening to Guggenmusik is minimal, I do find it quite impressive that they can march, dance, wear obstructive costumes and masks, and still play recognizable music that they have memorized. All this while on the sauce. Basel and Luzern have the the most famous Fasnacht celebrations in the country and Bern, though much smaller, also celebrates with aplomb. In Luzern, Fasnacht lasts from Schmutziger Donnerstag, Fat Thursday, to the following Tuesday, Güdisdienstag. At 5 am on Thursday there is the loud Urknall or bang, that signals the start of the festivities. From here the Guggenmusik begins, trundling through the streets, and stopping occasionally to do a bit of choreographed horn waving or drumming. The party and the music continue all weekend. In Luzern, both spectators and participants dress in costume, and masks are especially popular. Each year they expect on average 30,000 active participants and 150,000 spectators, though of course this depends on the weather. On the eleventh of November at 11:11 am, the Fasnachtsbär is sent to the Käfigturm for hibernation. On the Thursday after Ash Wednesday, he is set free, and so begin the Fasnacht festivities in Bern. Bern was not one of the traditional Fasnacht locations, as these celebrations had been banned there during the Reformation. It wasn't until 1982 that the Bernese Fasnacht was re-instated. Generally, this makes it a much smaller party, with only around 1,200 participants and 100,000 spectators. But just as much confetti. The Basler Fasnact is Switzerland's biggest with 20,000 active participants and 200,000 spectators. The first mention of the celebration was in 1376. At 4 am on the first Monday after Ash Wednesday, all of the lights in the display windows in city shops are shut off and a parade proceeds throughout the old town with beautifully painted lanterns. The festivities continue for the next two days, with Guggenmusik featured on the Tuesday. 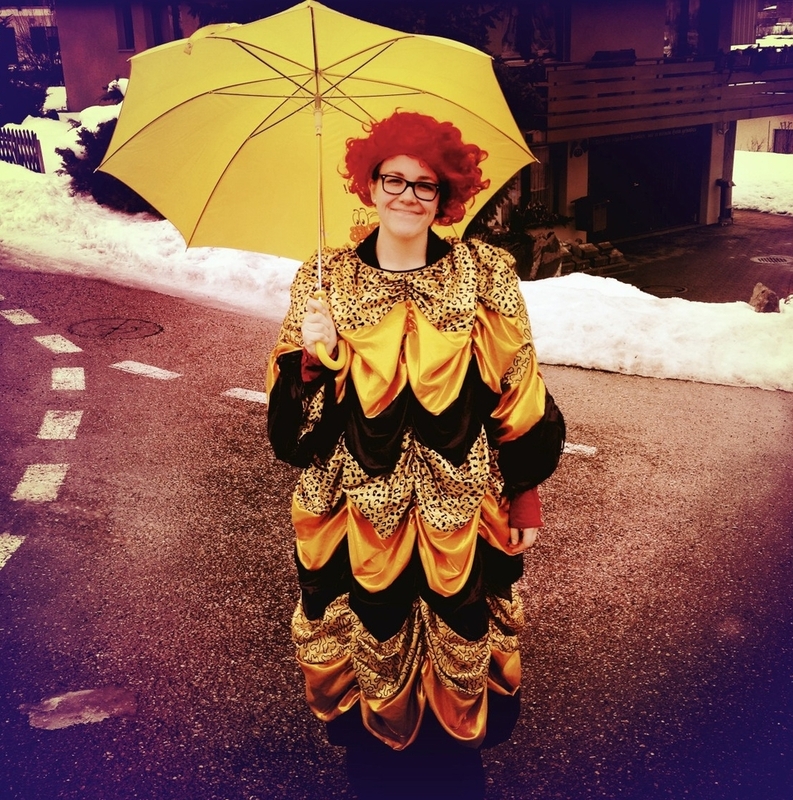 Generally during Basel's Fasnacht the costumes are reserved for the active participants and children and not the adult spectators. If you do wear a costume and aren't playing an instrument, you may find yourself the target of a deluge of confetti. I've only been to Fasnacht once, in Schüpfheim, Sam's hometown. We dug around in his parent's attic until we found suitable costumes, then watched the loud, enthusiastic parade down the main street. The weather was that delightful combination of rain, snow, and wind that leaves every inch of you wet and cold, despite foolish attempts to stay dry with an umbrella. But with steaming Kafischnapps in hand, bellies full of greasy food, and scores of blissful children and Guggenmusikers the day passed quite pleasantly, despite the weather.